Miss Beamington came through for us again. 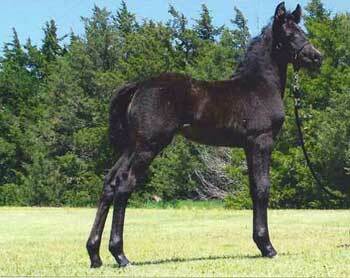 An eye catching, black filly with no white. GRM Miss Black Beam has big eyes and a wonderful trot. Her half brother, "Chester" has 5 World Champion titles, 4 Reserve World Champion titles, 4 National titles, and 2 Reserve National titles. All these accomplishments in 5 years worth of showing at the Grand National Morgan Show in Oklahoma City, OK. Miss Black Beam has the same potential to accomplish these kinds of awards also. 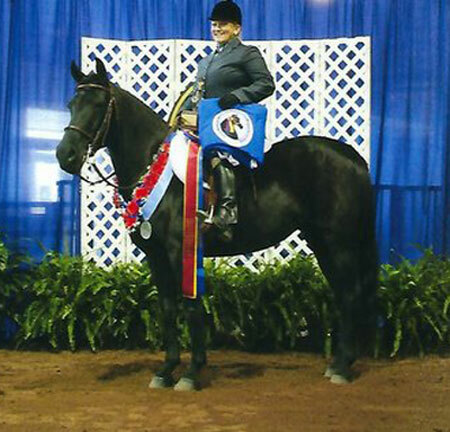 Her sire, "Flaire", is outstanding in harness, so she should have dressage and carriage potential. The gal should mature 15.1-15.2 hands. She was imprinted at birth, haltered at one day of age, bathed, & trailered.